We know that the 10.5" radius, while not optimum in On30, it is usable. Now we need to start designing a layout that will fit in my workshop. 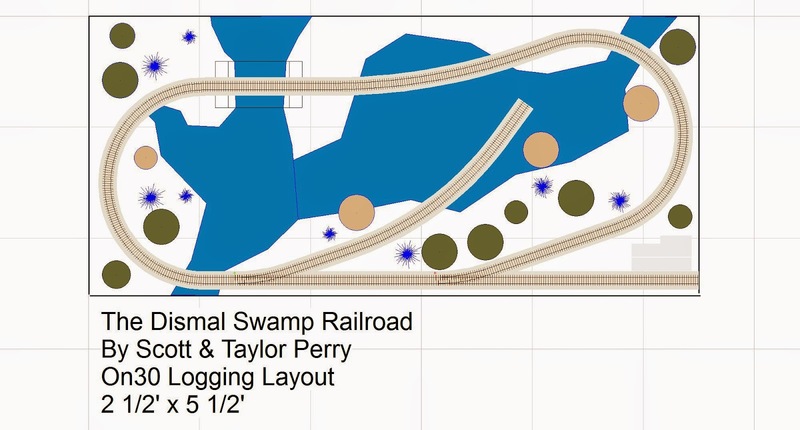 My daughter wants me to build a swamp layout again, which would be easy since I have most of the equipment and molds available. Taylor helped me design a very simple layout. 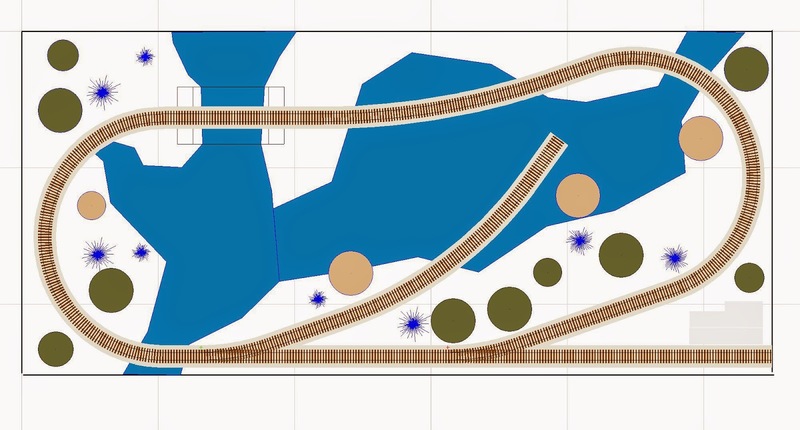 While the track plan is quite simple, the scenery effects will be complicated and make it very viewable. We started with an oblong oval, and added a spur and a off-line main. 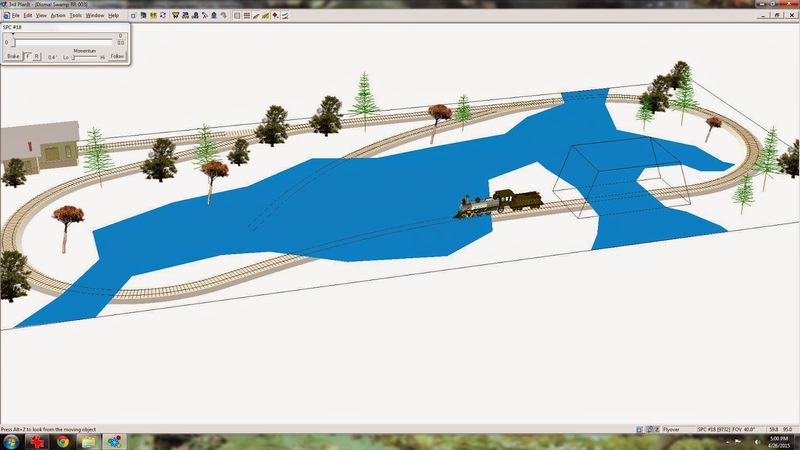 We put a few trees and the swamp onto the 3D view and ran a train. Taylor enjoyed running the train. While the real feel of the dense overgrowth is not felt here, I've sketched swamps enough that I have a good feel for it. We have the wood we need to make this over the course of next week. Still, I'd like to build a mining layout. A couple of us decided that in November, when the Division has their annual train show, we should have an On30 layout display available. I have very little room for building a large portable system so it has to be very compact. For this I'll need a very tight radius. For the radius experiment I'll need the help of my two assistants, Taylor and Katie. We are going to test a tight radius for On30 that will fit in a two foot wide space. The girls marked off a two and a half area of the card table using masking tape. Next, the girls marked off another two and a half grid. Using a small On30 locomotive, a stretch of track and a DCC system, we'll test a 10.5" radius curve. I've added an 18' ore car to give us a feel for the coupler swing. I had not put the car on the track correctly, so Taylor assists in getting it back on track. Bump! Bump! Bump! What the heck is that? We looked and looked, and discovered that the locomotive has a gear bind that is making it operate problematically. The radius at this very tight 10.5" radius does work, so we can build a tight layout. Train shows aren't much fun for me in Utah because there is virtually no On30 products on the tables. Occasionally I find an O scale item that I can use. Recently I saw this laser kit from Wild West Scale Model Builders at http://www.wildwestmodels.com/. The kit that I chose was the Franke Furniture & Coffin Shop, which you can see here http://www.wildwestmodels.com/products/franke-furniture.html. I liked the lines of this model. It is very interesting on the deck/smokestack side. It is also a multi-function building that can be easily modified. I paid $148.99 for the model. That was a bit more than I would pay for a small laser kit, but I liked it and there was nothing else interesting in the show. Lord Bentley of The Shetland Islands has appeared to inspect my work. Good boy! Wow! This is probably the best set of instructions that I've ever seen. Its a book, a thick one, I believe strongly in reading the directions BEFORE you start. The book has been in the car with me for several weeks and I've read it cover to cover several times. The book is mostly in black and white, but the drawings are crisp and clean. There are great ideas included. Ok...let's go see if they work. Before I get started I spend time figuring out what it is exactly I want to build. Yes, there are instructions and a pretty cover shot on the box. But I can guarantee you, I NEVER build a kit like it is supposed to built. There are two reasons for that. The first is that I just don't like seeing the same kit on every single layout, with all of them looking the same. I've seen the Atlas barn (probably under another name now) about a billion times. It always looks the same. The second is that when I build a layout I have a theme, a date and setting, and each structure has an age. Each of those and other factors gives the structure a unique look. For instance, let's look at setting. This building, built at the same day, date and time, would look amazingly different if built in Colorado and Kentucky. The Colorado building would have brownish red streaks and less weathered. The Kentucky building would be a silvery blue-grey with heavier weathering due to more humidity in the air. Time spent figuring out what you are trying to make will show as quality when you put it on the layout. The next thing I do is look at other modeler's interpretations of the same building. I do this not so much to steal ideas but to force me to look outside the box to see what new ideas I can bring to the table. Wild West has a page with their customer's model shots, so I started there, on page #2. My decision is this will be an eastern building, built in Kentucky, with moderate weathering and use wear and tear. It may be used on an upcoming demonstration layout for the Skeleton Crew. Next, we start work. The instructions say to color (I never say paint because that implies paint instead of other coloration techniques) so I start preparing parts for painting. There are two types of people in the world; those that divide the world into two types of people, and those that don't. For those of us that do divide the world into two types of people, there are two types of people. There are those that put nail holes into boards because they think you can see them on the prototype, and those that think it is a waste of time. I'm a nail holer. To do this I use a pin vise and a needle. The pin vice is pointing to one special board. Boards have a finite length. While board separations are prevalent on the model. However, a close eye shows this board to be 27 feet long, which is highly unlikely. Therefore, using a SHARP hobby knife I cut some extra board separations to make it more realistic. After cutting the boards I emboss the nail holes into the boards and we are good to go. Next I send all the edges of the piece. Laser cutters do not cut at a 90 degree angle to the surface but a few degrees off of 90, which leaves an angle on the side of the piece. I sand it and any sprues down with a fine grit sanding block. I keep moving on to the next piece. With this type of plywood the sprues are VERY TOUGH. You have to be careful cutting them so as to not break the piece. I keep the blade in my hobby knife very sharp. While removing the scrap material I keep the pieces in a bag marked "scrap." I do this because, should I break something, I have the same thickness wood to make a repair piece. The extra wood is also used for structure modifications. On long piece cuts I worry about the board breaking. To reduce the risk I use a steel straight edge to prevent the knife from slipping. Some of the pieces are lasered on BOTH sides so that the inside of the building can be detailed as well. Naturally the inside and outside of the building don't weather and get painted the same. My trick is to figure out which is the outside and to put a bright yellow dot on that side. I keep a pack of these on my workbench, along with a glass of Jack Daniels on ice. I put a yellow dot on the instruction page for the piece as well. Enough for tonight. Give me some time to get back into the swing of blogging! Questions are welcomed. I recently went on a trip to central Utah, taking the road less traveled, when I stumbled across this little gem. My brain is failing, but I knew in my photographic memory that I had seen it somewhere before. Slamming on the breaks, I grabbed the trusty Cannon and started shooting. I think what caught my eye is that it just looked like a model. Its sitting on top of the dirt, not in it, as many models do. It had really interesting door features, and it was abandoned and old which will catch a narrow gauger's eye in a heartbeat. It is sitting on flat farmland with too very old cottonwood trees guarding it. The building area is very well kept for an abandoned structure. I so wanted to peak inside! Here you can see the unusual doors straight on. I took this to make a decal with it should I choose to build one. After I got back the little building kept haunting me. I knew I had seen a model or a kit of this structure. 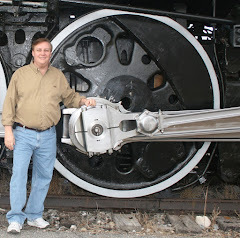 Finally after a photo search on Google I came upon the site of my friend Chris Brimley of TrainLife fame. 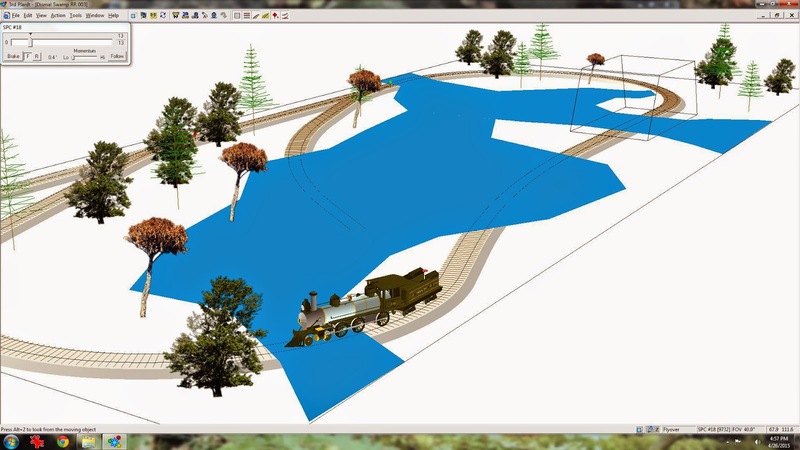 He had built a model and published it in Rail Model Journal. Here is a link to how to build this wonderful structure. I took several duplicate photos, so I only posted the best ones here. Have fun!